Mothers and daughters have a very special bond that cannot be broken. It is a bond that crosses over..
HEART CRYSTAL WITH 2D/3D PHOTO ENGRAVED This apple crystal cube is one of the larger of the collecti.. Style: Infinity necklace Chain type: Rolo Chain Infinity Size: 0.6 x 1.8cm/0.24"x 0.72" Pe.. 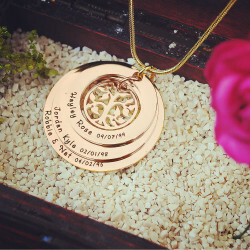 The latest fashion forward trend in jewellery is family tree jewellery. This beautiful 18ct Go..
Do you have more love to give? Then this design is the perfect match for you. With 3 hearts joined t.. This is a wonderful choice of gift for any occasion, age or gender. You can have your own special me.. Style: Name Necklace/Love Necklace Pendant Size: 3cm /1.2" Hook: Single Hook Chain type: Cable ..